HE stood in his white cassock, his shoes slightly sinking into the tree bark laid like a carpet in front of the Cenotaph. He intoned about the need to remember those who had given their lives in the last two world wars, soldiers and civilians alike. Above him, a small flight of blackbirds swooped up and down, in and out of the trees of Hampstead Cemetery, and I thought at that moment about the bomb that had destroyed a row of houses just a few hundred yards from where I stood on Saturday one day in 1944. The Reverend Alistair Tressider of St Luke’s Church had described the bomb as a “rocket”. But those who lived through the Second World War feared it as a V1 Rocket or “Doodlebug”. I remember seeing one as a child, darting through the air. As long as it was above you, you were safe. But once the engine cut out, you had to run because that’s when it landed – in a burst of destruction. 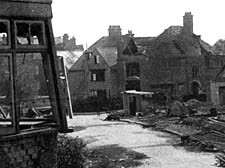 Such a bomb had destroyed four houses in Ardwick Road, West Hampstead, just behind the cemetery, killing two people and wounding 12. All long ago, but Rev Tressider wanted the 40 people gathered for the Remembrance service to cast their minds back to that awful day. He distributed photocopies of a photograph of the blitzed houses in Ardwick Road he had found in a local history book. But war, I found on Saturday, takes its toll in many ways – even when the conflict ends, relatives cry in anguish when a loved one dies from wounds, many months or even years after the war has ended. I thought of this as I read the names of those who had died in the First World War, the short biography of their lives chisseled in the stone of the low wall that encases the Cenotaph. I noticed the names of two servicemen who had died in December – a month after the war ended in 1918. Ruinous, devastating, evil war – the Rev Tressider cried out against it. As did the senior Lib-Dem councillor Flick Rea who recited the haunting poem In Flanders Fields. After prayers, and a two-minute silence, we all walked off to another memorial to the civilians who had died, a simple piece of stone work refurbished last year under the direction of Flick Rea. There, by the side of the memorial, were the names of some of those who had been killed locally – on one side, I noticed that three members of the Mitchell family had been killed. Adults? Women? Children? We are not told. Just the name Mitchell. There were relatively few people at the ceremony which made me think that many readers did not know about it, but I do hope that some will now make an effort to visit the memorial. There are bloody wars taking place now, in Iraq and Afghanistan. They have fallen off the front pages, but they remain living nightmares for the combatants and the innocent civilians killed – in Iraq thousands have been slaughtered. I believe Britain should withdraw its troops from both these areas of conflict. If we won’t, then aren’t we turning Remembrance Day into a bit of a hypocritical ceremony? What’s the point of remembering the past, if we don’t do something about the blood being spilled today? I WAS almost throwing it away as yet another piece of junk-mail after it had been pushed through my letterbox on Sunday – until I saw the large logo “SOS for the NHS!” in the top left-hand corner of the front page. But who is Jo Shaw? Oh, how I felt fooled, when my eye, wandering down the page, spotted the answer: she is, of course, the Lib Dem parliamentary candidate for Holborn and St Pancras. She is entitled, of course, to campaign as a saviour of the NHS, which is clearly under threat, but, basically, her effort to save this great institution is all bound up with her political ambition – and this is not made absolutely clear in her missive to residents. Rightly or wrongly, it’s one thing if writers or journalists try and conceal their views, but surely what we want from politicians is sheer, naked honesty! Who’s in frame for stealing from artist? SO there I was, enjoying a coffee and a chat about Norman Mailer with Judith de Beer when suddenly someone stole her handbag. Judith is a sketch artist whose work has included drawing almost every writer in the 20th-century canon from William Burroughs and Edith Sitwell to Saul Bellow and Isabel Allende. Her drawings have appeared in many national newspapers. At Costa Coffee in Golders Green on Tuesday, she was telling me about her four meetings with Mailer, the great New York literary maverick who died this week. The first in the 1960s was at the Savoy Hotel when Judith was in her 30s. Suddenly, as we talked, Judith realised that her handbag had gone. The young woman behind the counter expressed her regret. There was CCTV, but the barista said: “It doesn’t work where you were sitting.” I rang Costa’s head office, and they’ve promised to look into it. In the meantime, here’s Judith’s sketch (above) of the great womaniser who didn’t jump on her. THERE is a modest doctor living in Primrose Hill and I am sure the following words in his honour may discomfort him, but I am so impressed by his many talents I feel bound to share this with you. I received an invitation from Royal Free volunteer Eva Ratz this week to a viewing in her Hampstead home for a charity art exhibition. Eva works tirelessly for the Friends charity, picking artists for exhibitions at her home to raise funds for charity. This year, on the 20th anniversary of her exhibitions, she has dedicated the proceeds to the Marie Curie hospice in Hampstead. The show is in memory of a woman who helped her set up the exhibitions, Marion Beiber, who passed away in April. Among the exhibitors is the retired Camden doctor John Horder, president of the Medical Art Society. I recently approached John to ask him if we could feature his work in our Review section, but, being a retiring type, he said he had written a memoir for friends and family. But his artwork is so stunning I can’t help but use the opportunity of this exhibition as an excuse to praise it.